(Newser) – If a giant solar flare hit the Earth, it could knock out the entire power grid, meaning no more new Justin Bieber singles, no more televised presidential debates, and no more Facebook photos of babies. But it wouldn't be all good news. The Washington Post reports the electromagnetic pulse—or EMP—created by such an event could wipe out electricity for months on end, creating a global catastrophe. 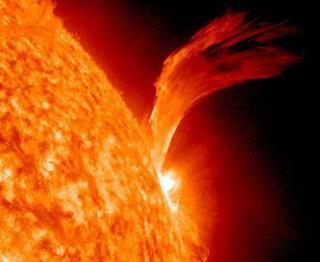 That's why the White House released its National Space Weather Strategy on Thursday. According to the Houston Chronicle, the multiagency plan details how the US will prepare for—and deal with—a massive EMP from space weather. The six-step plan requires government agencies, schools, the media, the insurance industry, nonprofits, and more to work together. In other words: We might be doomed. Funny thing is, the Amish will be living as if nothing happened. If you get your water from a well and are concerned about threats to our electrical grid, you may want to check out the Emergency Well Tube. This backup tool allows water to be drawn from a well without power and without having to pull the well pump to use it! Wake me up when we start getting super-powers.